New Jersey Gov. Chris Christie talks about the power of education and MCCC's role in revitalizing Trenton, as MCCC President Dr. Jianping Wang and NJ Secretary of Higher Education Rochelle Hendricks look on. 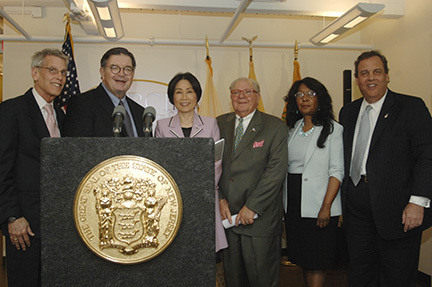 Dignitaries present at the ribbon cutting for MCCC's new Trenton Hall in downtown Trenton, from left: Mark Matzen, chair of the MCCC Board of Trustees; Mercer County Executive Brian Hughes; MCCC President Dr. Jianping Wang; Pasquale "Pat" Colavita, chair of the Mercer County Board of Chosen Freeholders; NJ Secretary of Higher Education Rochelle Hendricks; and NJ Gov. Chris Christie. 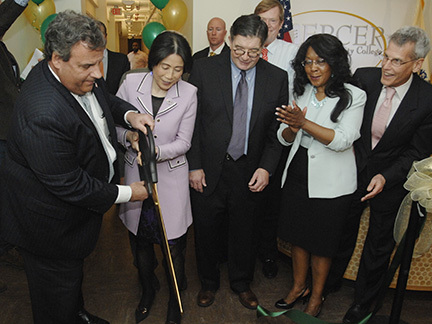 NJ Governor Chris Christie and MCCC President Dr. Jianping Wang cut the ribbon for the new Trenton Hall Annex on the college's James Kerney Campus, with Mercer County Executive Brian Hughes, NJ Secretary of Higher Education Rochelle Hendricks, and MCCC Board of Trustees Chair Mark Matzen. TRENTON – Mercer County Community College (MCCC) has added another chapter to higher education in downtown Trenton with the official opening of the Trenton Hall Annex, a modern, three-story building focusing on high-tech career opportunities at the college’s James Kerney Campus (JKC). A ribbon cutting ceremony marked the official opening of the new building, and also served as a celebration of recent development projects in downtown Trenton. The morning began with the “Moving Forward Bus Tour,” sponsored by Greater Trenton, which was followed by a ribbon cutting attended by elected officials and business leaders, including New Jersey Gov. Chris Christie, NJ Secretary of Higher Education Rochelle Hendricks, Mercer County Executive Brian M. Hughes, and Trenton Mayor Eric Jackson. The Trenton Hall Annex features state-of-the-art technology, with classrooms to provide instruction for the new Security Systems Technology and Cyber Security programs, as well as space for existing programs for Certified Nurse Assistant, Phlebotomy, and EKG (electrocardiogram) Technician prep. The building is connected to the recently-renovated Trenton Hall, which opened in 2012. Total cost for the construction of the 8,500-square-foot Trenton Hall Annex is $5.9 million, which includes demolition of the building previously on the site and renovations to the adjacent Trenton Hall. Initial funding for the project was made possible by the Building Our Future Bond Act, passed by voters in 2012. The opening of the facility coincides with a recent push at MCCC to enhance opportunities for a technology-driven workforce, including scholarship opportunities for STEM (science, technology, engineering, and mathematics) students; “earn as you learn” relationships with the Security Industry Association, Genesis Biotechnology Group in Hamilton and Domain Computers in Cranbury; and an Advanced Manufacturing Technology facility that will open on the West Windsor Campus later this year. Gov. 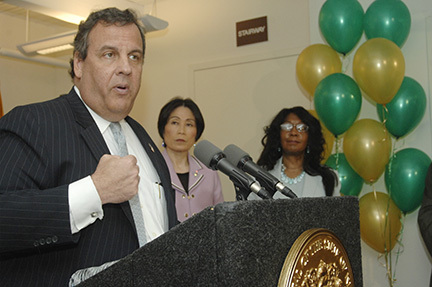 Christie praised the efforts of the college to advance a technology-focused curriculum, and for its investment in Trenton. “The opening of Trenton Hall is another step toward creating a dynamic downtown environment in Trenton, one that benefits residents, workers, and students,” Christie said. “The Trenton Hall Annex is also a large investment in our state’s higher education infrastructure, focusing on STEM growth areas, such as Cyber Security, Security Systems Technology, and medical programs.